Recently, I was inspired by the win of Laura Siddall at Ironman New Zealand 2018. Her mantra? “Don’t die wondering.” This hit home in a way that took me completely off guard. Let me rewind a bit and explain. Last weekend, I trekked down to Florida for my very first EDR race. This stands for “elite development race.” There was a race on Saturday and one on Sunday. The set up of the race was a half mile swim, 4 x 3 mile loops for a 12 mile bike course, and a 5k or 3 mile run. In this format, you can draft on the bike which is a huge no-no in long course triathlon. If the leader laps you on the bike, you are out of the race. It is a very intense, fun, exciting, heart in your throat kind of race. However, every little mistake is amplified in this short format. To make a long story short, I had a lot of fun and got to race with some high school and college triathletes who are a lot more experienced than I am at this type of race. It was very humbling to not really be at the top of my game and to be forced out of my comfort zone. I learned a lot and had a ton of fun. But at the end of day 2 of racing last weekend, something inside my heart was screaming out to me. I have been saying over the past couple of years that I wanted to be a pro triathlete. But I have been dancing a fine line between trying to qualify for Kona and trying to get my pro triathlete license. In 2016, I qualified for Kona but the race wasn’t until a year later in 2017. On top of Kona in 2017, I did 4 Half Ironmans. 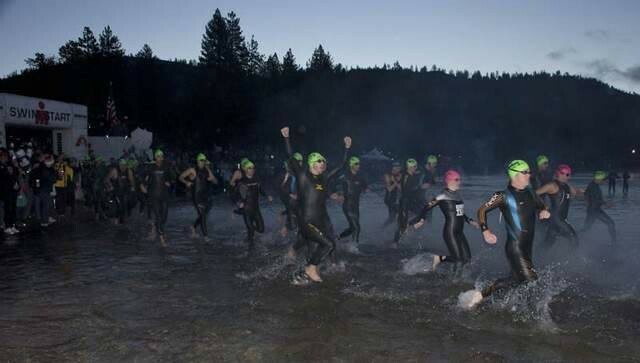 At my last race in August, at Steelhead 70.3, I narrowly missed my pro qualification by a minute and 30 seconds and one spot. Despite feeling like I was in the best shape of my life, I sort of went into Kona with perhaps more fatigue than I realized. Just being at Kona and soaking in the atmosphere was a dream come true but I was not completely satisfied with how my race played out. After the race, some deep contemplation, and a couple weeks off from training, I decided along with my coach that I wanted one more go around at Kona in 2018. Kona and I had some unfinished business. Then, trying to get my pro card was sort of a secondary goal put on the back burner yet again. When I saw Laura Siddall’s mantra, I realized, the time is now. There may only be a limited time left for me to become a professional triathlete. I do not have a crystal ball that can tell me where I am going to be in the next few years, what my job is going to be, if I am going to move again, if I am going to start a family. The time is now. I don’t want to die wondering, what if I had put my whole heart into becoming a professional? I know it isn’t an easy or conventional or a lucrative goal. But being out there and racing is what makes me feel most alive in this life. So I am going to chase that feeling and hold onto it for as long as I can. It’s taken me a while to come to this realization, but it is indeed now or never. I know many people also do not understand this goal or how much it takes to get to the point of being able to turn pro. I just have to trust myself and know this is what makes me most happy. So as of today, I have withdrawn from Ironman Texas and am setting my eyes solely on becoming a pro. Maybe it won’t happen. Maybe it will. But I can’t die wondering. Nice! I can’t wait to see what you do! I am so proud of you and what you have already done and what you will do in the future. I can’t wait to track you for every race. Good luck, I am rooting for you! This is a great post. You have to follow your dream! Follow your heart and enjoy the journey! It will be fun to follow your journey!